Posted by Jonny Greenwood on 11/28/2018 2:58:58 PM. 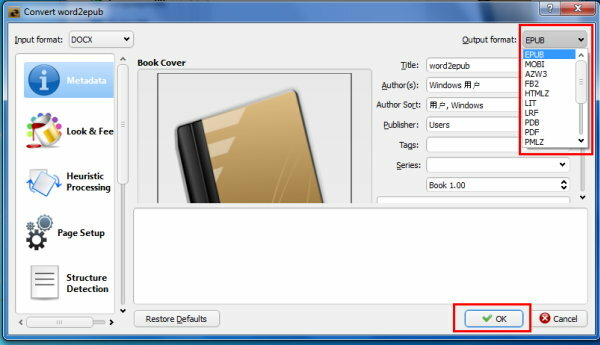 You know Calibre is a free and open source ebook library manager, so if you want to convert word to epub, Calibre can also help you. 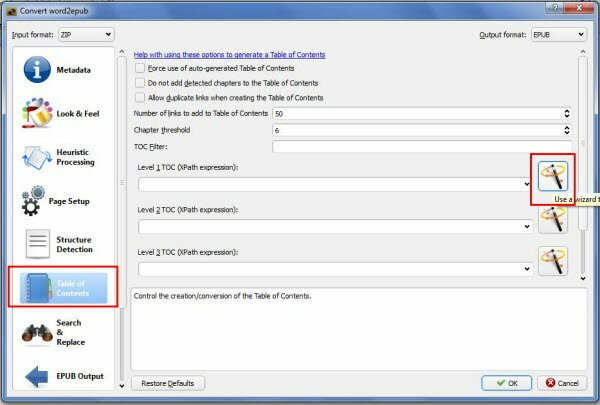 Yes using Calibre to convert ebooks such as convert azw to pdf, steps are easy to go, just add books, choose output format and then convert, OK. But, Converting word to epub with Calibre is not so simple as you think. As the systems of our office tool is different, so the way to perform this task differs a little, too. Occasion 1: if your office tool version is Office 2007 or above, convert docx to epub. Occasion 2: if your office tool version is Office 2003 or below, convert doc to html to epub. This part is written for you if you are using Office 2007 or above on your computer. Firstly download Calibre and select a proper version for your computer. As you are using Office 2007 or even above, and Calibre supports this format, so open your word document please, then save as ".docx". Run calibre, then click "Add books" to choose your word documents which are with .docx extension. 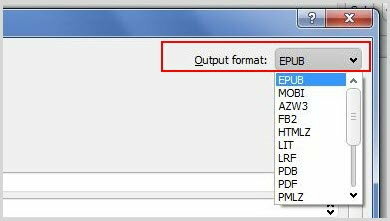 Click on "Convert books", then at the output format pull-down list select epub please. Then "OK" the conversion. After completed, you can "click to open" to get a preview. Now you can read your epub files on your computer, and even transfer them to another devices such as iPad, Kobo, etc. 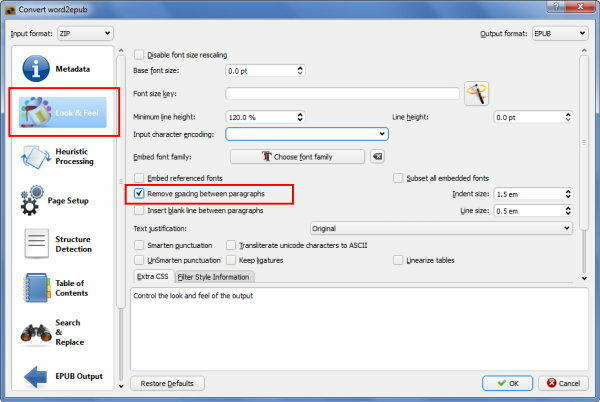 Tips: If you want to convert your word documents to PDF high polished to print good, choose PDF Creator. This part is for those people who are using Office 2003 or below. As Calibre doesn't support the format of doc, we need firstly convert our word document to html, then convert html to epub. Firstly download Calibre and then install it on your computer. Firstly open your word document, change format style of the book title and all chapter titles to "Heading 1". Then save your documents as ".html" with the "Save As" option. Upload your just saved html files to Calibre with "Add books". Then click on "Convert books". 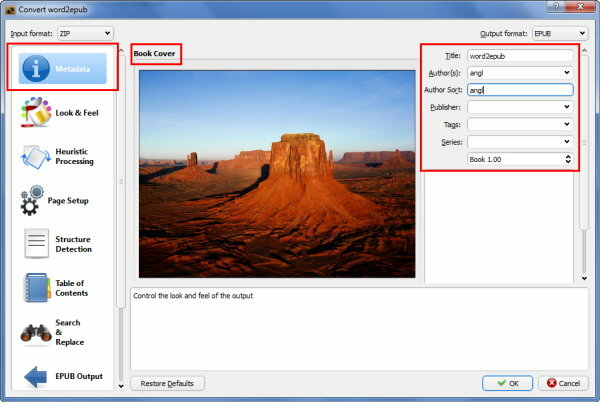 At the pop up window, hit the "Metadata" to edit, such as title, author, cover, tags, etc. From the left side menu, click on "Look & Feel", select "Removing spacing between paragraphs". Go on with the edit job, click on "Table of Contents", select the "Level 1 TOC" wizard button. 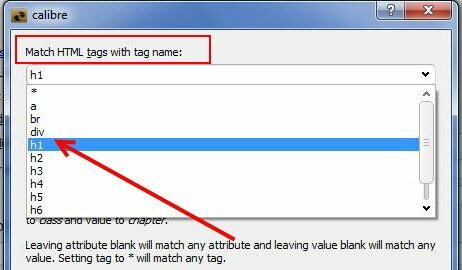 A new window named "Match HTML tags with tag name" will top up. From the drop down list select "h1" please. Then click "OK", you will see "//h:h1" is listed in the Level 1 TOC field. In the upper right corner still in this convert screen, find the "Output format" menu, choose "EPUB" to convert html to epub. Check all the procession during the editing, Metadata, Look & Feel, Table of Contents, Output format. If all the settings has finished, click "OK" to start your conversion. For details in this part click here to know more about converting html to epub . When you see "jobs:0" at the right bottom corner, it says that your conversion has finished. Come back to the main screen, at the right side click "Click to open". Now you can get a preview of your epub files converted from word documents. Besides, now you can read your word files as epub on your computer, you can even transfer them to your reading devices such as Kobo, iPad, then get a happy reading. 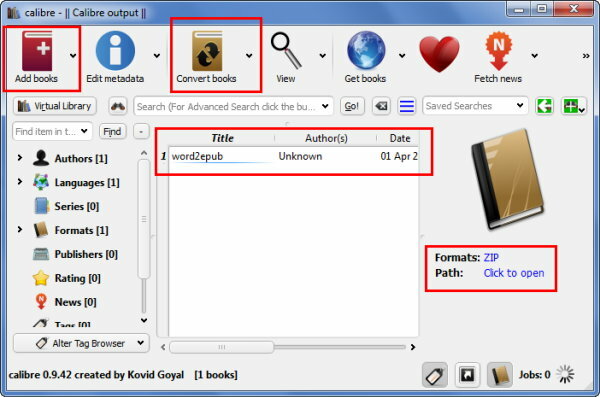 Wish this article could help you and had resolved your questions about converting word to epub. And, it also can give you good advice if you want to publish your files. Still think this is a little difficult to understand? How about trying this tool Epubor Wordmate? It helps you convert word documents to epub just with one click. -How to convert acsm to epub. 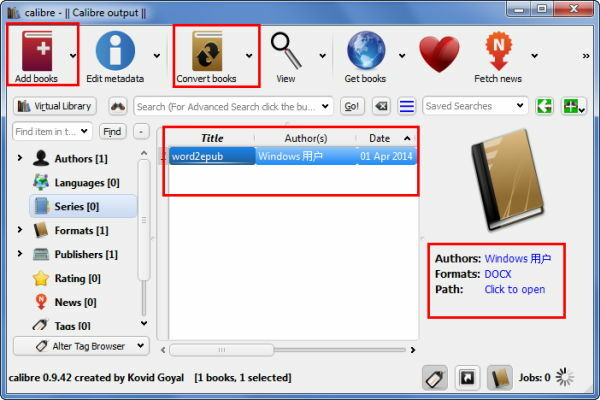 -How to convert kindle to epub.